Remarkably, the first time the West African neighbours have met in an AFCON, there is little denying that Tuesday’s dual with Guinea represents a hugely hazardous banana skin for Ivory Coast. Having seen Ebola stack the odds against them throughout qualification – to such a degree that Guinea’s voyage to AFCON 2O15 was the captivating story of qualification – the National Elephants present an opponent dangerously galvanised by severe adversity. Ivory Coast’s problems however do not stop with being allocated the assignment of deflating a side riding on a wave of unrivalled determination. Alongside Guinea’s strength of character, Michael Dussuyer’s side vaunt electric attacking resources capable of wreaking havoc on the counter – an attribute which could spell trouble for a sluggish Ivorian defence who were beset by problems throughout qualification. Guinea can draw inspiration from the manner in which DR Congo – another side with proficiency to break at pace – picked off Ivory Coast seemingly at will during an ignominious 4-3 home defeat for the Ivorians. At the same time if Ivory Coast were in any doubt as to the capabilities of Idrissa Sylla, Ibrahima Traore, Seydouba Soumah and co, then Guinea’s 4-1 mauling off Togo in Lome provides perfect evidence of their threat. To counter their defensive vulnerability – no side in Equatorial Guinea conceded more goals during qualification – the situation at the other end of the pitch is somewhat rosier, with les Elephants still able to boast some of the continent’s most prestigious attacking talents. Guinea are likely to allow Ivory Coast the bulk of possession – a dangerous tactic considering they themselves are less than well-endowed defensively. However, Dussuyer will perceive that approach as a more than calculated risk. Dussuyer has a key decision to make in regards to whether or not to restore Kevin Constant to his starting XI. On ability alone selecting the Trabzonspor would appear a no brainer. Yet that Constant has consistently courted disruption means his presence risks upsetting the balance of what was throughout qualification a side functioning as a highly cohesive collective. In Dussuyer and Renard the dual will see two of the continent’s most respected coaches square off. 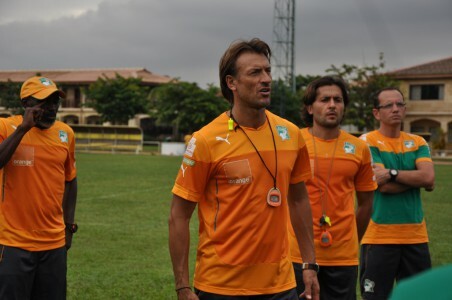 Dussuyer entering his fourth AFCON and possessing arguably unrivalled knowledge of his players is accredited as a key factor in Guinea’s remarkable qualification, whilst Renard earned iconic status following his masterminding of Zambia’s success back in 2012. In what is a testing group a defeat for either side would leave a treacherous route to the quarter-finals, particularly Guinea whose next assignment is a date with rejuvenated Cameroon. Even accounting for their fragility at the back, Ivory Coast should possess enough quality on this occasion to outweigh those issues. Further to that, such a glaring weakness means that for the first time in over a decade les Elephants won’t be shouldering expectations as favourites. That said, there is enough scope for Ivory Coast to come unstuck against a side more capable of praying on their weaknesses – make no doubt about it, Tuesday’s date with Guinea contains the required ingredients to cause an Ivoirian slip up.